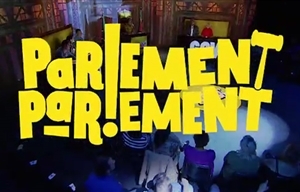 Parlement, Parlement is a format created and produced by Both Worlds. The executive producer is Thierry Cassuto and the supervising producer for kykNET is Marguerite Albrecht. Karen Jeynes is a producer and the head writer. Other writers on the series include Louw Venter, Sergio Pieterse, Marion Holm, Anne Hirsch and Margit Meyer-Rödenbeck. Original music is by Gerhard Grobler and Both Worlds Music.